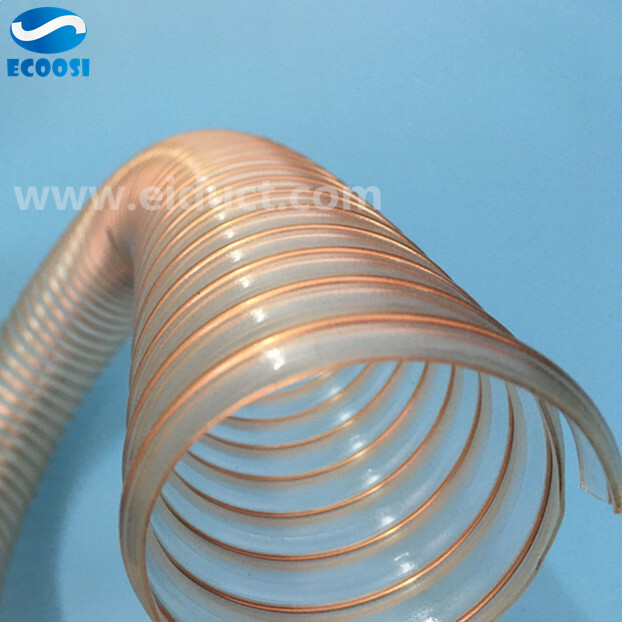 Ecoosi flexible ducting hose - PU Ducting is a flexible polyurethane hose made for air, dust, and light material applications. 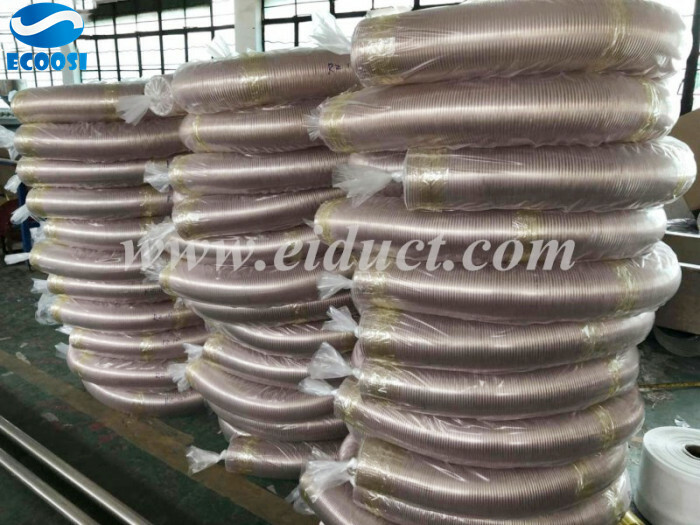 This duct hose is produced from polyurethane hose materials and is recommended for industrial air movement, fume control, and dust collection applications. 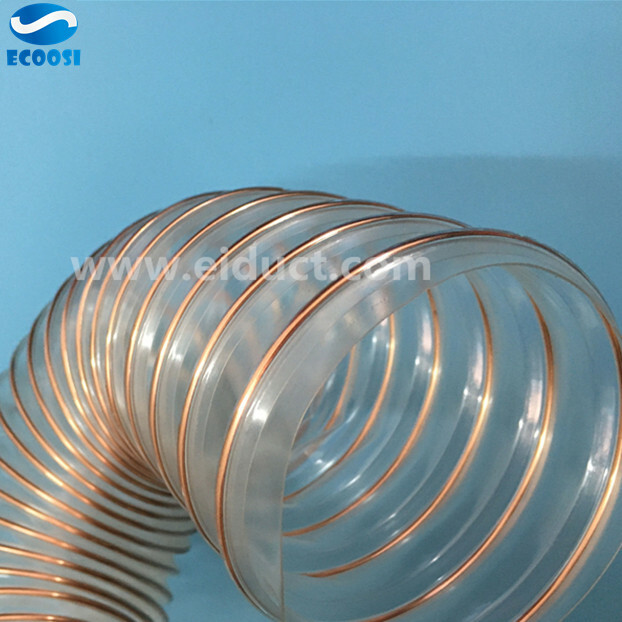 Its polyurethane wall and spring steel wire helix reinforcement gives the PU Ducting hose excellent compressible, abrasion resistance, and chemical resistance. 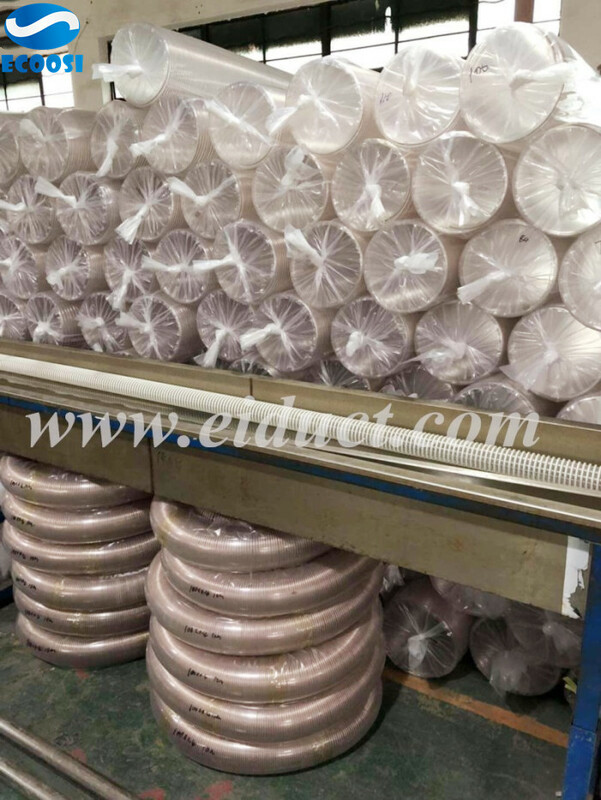 Its thinner wall permits the polyurethane hose to have excellent compression rate to 4 to 1, lower weight per meter, and great flexibility. One of the main benefits of polyurethane hose is their excellent resistance to wear in both sliding and impact abrasion. 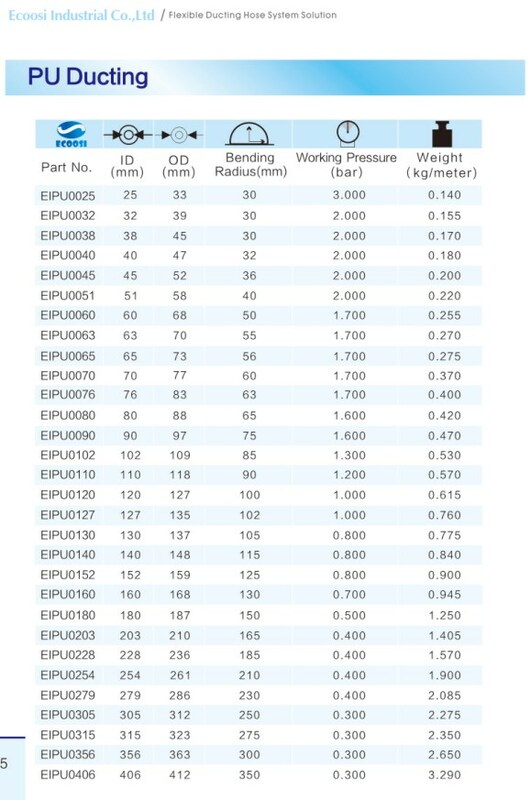 Polyurethane hose have excellent resistance to fuel, oils, grease, and many solvents. Its makes them especially suited for applications such as automotive, steel and aluminum manufacture, and printing. The lightweight hose are available in a black or clear flexible hose colors. A clear flexible PU hose also allows operators to see clogs, Its makes for a perfect woodworking dust collector hose! 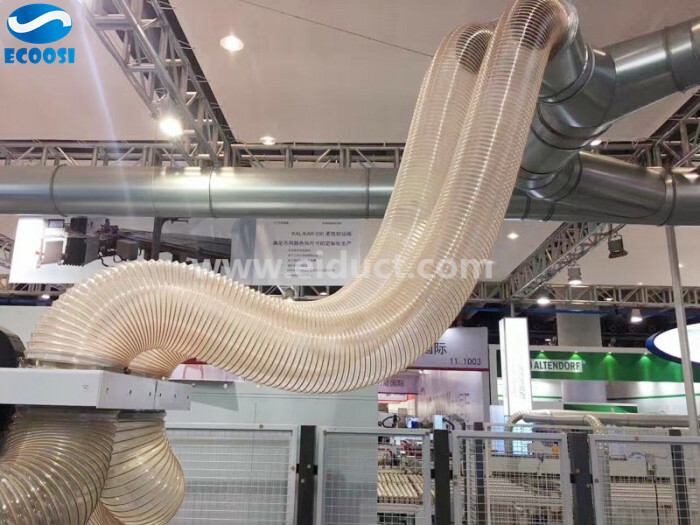 Ecoosi's PU Ducting hoses are built with hose materials that allow them to work in a wide range of temperatures from a low of -40 to a high of +125 degrees Celsius. 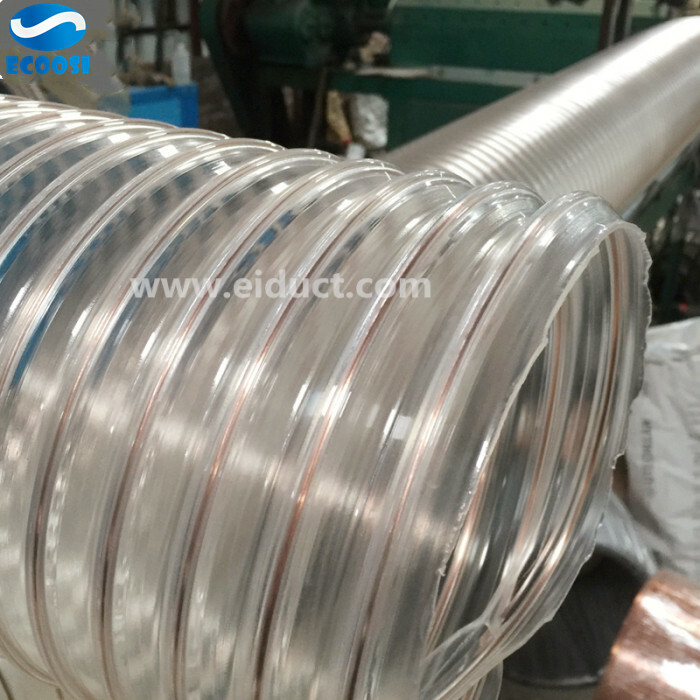 Ecoosi's PU Ducting hose come in a standard size of 10 meters with a plain cut end finish. The flexible polyurethane hose is available in either clear or black, and ID sizes range from 25mm to 305mm. 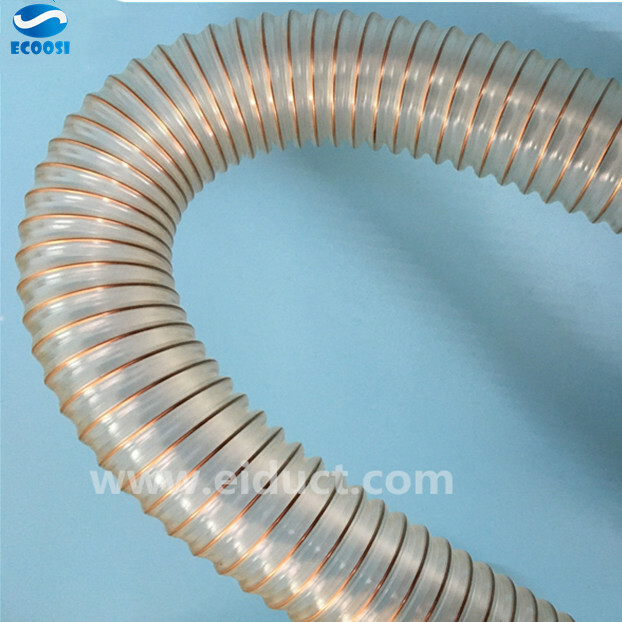 Ecoosi's PU Duct hoses are made for light-duty air, dust, and material applications such as landfill venting, leaf collection, ultra violet dryers, pharmaceutical work, and paint spray extraction.